Just picked this up. Size 48. Brand new with tags..
Any suggestion's on who to put on it? No help from me, but this should become the new "who to put on" thread! They used very unique numbers on the back of that. You had better make sure that someone can do it right, otherwise leave it alone. If you want to see an example, go here: HockeyJimm. He is/was a member here, and has a great collection of IHL jerseys. Is this for the IHL team? If it is there a couple of names to put on it. Don't know if some of those players have wore that style of the jersey. Wile E. Coyote, he was always chasing the roadrunner. Hopefully, you're not too young to understand this reference. So I'll post some more I need help on in a while. But with this Roadrunners, I know where they can do it correctly and I am really just confused on who to put on this. They wore these in 95-96 and 96-97. Just wondering if someone maybe had a program or picture of these being worn. A player with an A or C would be sweet. That Bauer logo wasn't used until 96-97. By far, one of the nicest jerseys ever!!! 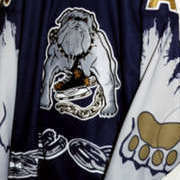 Is it possible that your boy Broten may have worn one?? He played 11 games for them that year, it was entirely possible! Ohhh that'd make me SO happy to have proof that Broten wore this! Apparently they wore them for 2 seasons on SUNDAY home games..
just do it. who cares about the video. its your jersey and it will look SICK!! It's not like you will flip it so put Mr Neil on it. That is correct, but the original block logo was used by some teams well into the 1997-98 season. It was a running change and never appeared until the late portions of the 96-97 season. It was easy to spot due to the addition of the logo on the front left shoulder. Usually if there was a trade (there were plenty of trades in the IHL), or demotion and the team had to get a fresh supply of jerseys from Bauer/SP. In reality, I wouldn't worry about that tiny detail, I would worry about getting the correct numbers and font. If that can be done right, anything else is gravy. I doubt if any player wore a 48, so it would never be completely correct. The mfg's logo is a much smaller detail than getting the correct size the player actually wore. I most likely will rock the Broten! I'll post others I'm considering as well. I don't know how to pin this but I have like 6 other jersey's I might throw up for sh*ts and giggles.. It'd be awesome to have others post there blanks as well..
One with the vintage V, one without. I kinda already have in mind what to do with both of them, but I'll entertain suggestions to change my mind! I think you rock the Vintage patch on there for sure and go with the obvious..
Linden with the A or the Sedin twins work to with that Vintage patch added..
Kesler and Burrows were Manitoba Moose when this style was worn..